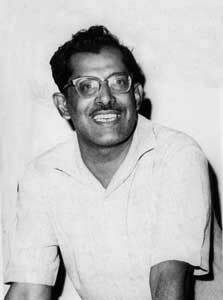 Hrishikesh Mukherjee dead at 84. Anand may not have approved in full measure. After all, that adorable character from the 1970 eponymous film had declared with die-hard flamboyance *Zindagi badi honi chahiye, lambi nahi. * (Literally translated: Have a “big” life, not a long one.) The line was dialogue-writer Gulzar’s; the sentiment unmistakably director Mukherjee’s. But his mourners, a now-middle-aging generation of Indian filmgoers who first came under the spell of mainstream Hindi cinema in the 1950s and 1960s, were agreed nonetheless that this Babu Moshai had lived a life that was truly “big” in creative dimension. Hrishida had not just outlived Anand’s dictum. He also seemed to have clumsily outgrown Bollywood itself and was clearly out of his depth working in what might have seemed to the veteran director like an alien industry with alien aesthetic and production values. Braving failing health, he last directed *Jhoot Bole Kauwa Kaate* in 1998, a swan-song that was sadly off-key. A warmed-up rehash of an earlier film (*Golmaal*), it disappointed on every count – thematic content, narrative flair, music and finally, box-office returns. The film’s failure began a period of intense personal loneliness and desolation in Mukherjee’s life which culminated in his death. The cliché that a thespian’s death marks the end of an era for once rang true. No other Hindi film-maker’s work typified the way the Indian middle-class lived and loved in the days before the “multinational” economic-reforms invasion of the 1990s topsy-turvied its near-frugal lifestyle and Nehruvian values. True, this *gharana* of film-making had other talented adherents – notably Basu Chatterjee, Gulzar, Sai Paranjpe and the late Basu Bhattacharya – but Hrishida was their undisputed torch-bearer and senior, both in age as well as all-round film-making ability and influence. It’s a point of telling significance that none of these worthies has directed any memorable film for more than a decade. To write a Hrishida obituary therefore is to pay moist-eyed tribute to an entire genre of Indian film-making that is now extinct. But what he as a director managed, without any fuss or self-conscious derring-do, was to deploy his solid technical knowledge of film-editing grammar to regulate his shot-taking style, thus curtailing the number and the length of his takes. Result: an enviable economy in terms of raw-stock consumption as well as studio time. Stars, I suspect, were a species Hrishida viewed and accepted as a necessary evil in his scheme of things. It was a taste for big marquee-names he had obviously inherited from Bimal Roy. 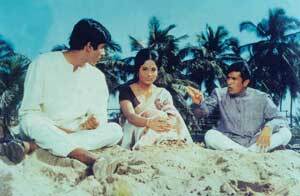 In fact, Mukherjee outdid his mentor in this regard by working with each of the star-trinity (Dilip-Raj-Dev) within the first five years of his directorial career. Like Roy, he was astute however in ensuring that the star’s on-screen mannerisms never got in the way of the character, and that the star’s remuneration never inflated the film’s budget beyond viable limits. The star, in turn, was often willing to forego the usual fat fee in return for featuring in a project of substance, in a landmark film guaranteed to enhance the star’s status as an actor. No one complained about this win-win situation, least of all the distributors and exhibitors who raked in ample profits from Mukherjee’s films. Perhaps his only shortcoming in dealing with stars was his widely-reported reluctance to crack the whip on undisciplined actors – something unheard of in a Bimal Roy project. 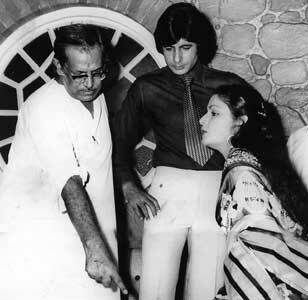 Hrishida indulged his actors like a favourite uncle, and so few were surprised when he called for his constant companion (his chess-board) on the sets after Rekha and Rajesh Khanna failed repeatedly to turn up for shooting *Khubsoorat* and *Bawarchi* respectively, and Amitabh Bachchan and Rajesh Khanna got into a childish tiff over who would die in the last scene of *Namak Haraam. * Whereas the script called for Khanna’s “death,” both wanted to be the film’s sole martyr. Only when the argument raged on and became a time-consuming stalemate, did Hrishida resolve it by threatening to have both the characters killed! Amitabh finally relented. Like Bimal Roy who was known to be a more-than-decent violinist, Hrishikesh Mukherjee was a connoisseur too, having been born into a musical famil. His brother Kashinath Mukherjee was a well-known sitar player in Calcutta. And like Roy, he depended heavily on songs to punctuate his film stories. Think of *Anari, Anuradha, Chhaya, Asli Naqli, Aashiq, Saanjh Aur Savera, Anupama* and *Anand* – and what strikes you is the thread of melodious numbers running through all of them. His innate musical sense prompted the inclusion of a hard-core Hindustani classical number in his debut film *Musafir,* a duet sung by Lata Mangeshkar and – hold your breath – Dilip Kumar! Playback singers, including queen-bee Lata, were often amazed at Mukherjee’s ability to suggest an apt musical nuance and explain its rendition in notational parlance at his song recordings. By assigning his heroes a regular 10-to-5 job, the film-maker rooted them firmly in their social milieu and made their concerns all the more palpable for his audience. It was – at the very least – a sensitive nod to the fact that we all spend a major bulk of our waking hours pursuing a vocation and also to the overwhelming probability that our vocation could be instrumental in shaping our world-view. If all this sounds just too mundane, obvious and mandatory for any believable story, start counting the number of “successful” films in the last decade that have met this criterion. Do you recall what Shahrukh Khan as the hero of *Kuch Kuch Hota Hai* – an all-time Bollywood blockbuster – does for a living? And how many screen minutes does he spend actually working on a job? It was this abiding respect Mukherjee had for honest and hard-working professionals coupled with his disarming humility that came through loud and clear in a lengthy meeting I had with the film-maker several years ago. After an interview about film-related matters in the confines of his study – during which he voted for *Satyakam* as his best work, and named Satyajit Ray as the most accomplished Indian film-maker – we settled on the porch of his seaside bungalow in the Bombay suburb of Bandra with mugs of tea and a mellowing sun for auburn-hued company. He talked about his long-time friend Raj Kapoor. The man’s commitment to cinema was matched, he said, only by his loyalty to friends, justifying the dedication of *Anand* to Kapoor with whom Hrishida had first conceived the project. He then talked of his scientist son. “You should be interviewing him, not me,” Hrishida said sharply. “He works very hard exploring the secrets of science so it can benefit mankind, and what do I do? Make people sing and dance, and create empty illusions to entertain others. It’s really nothing compared to what professionals like my son do for years on end without expecting material rewards.” He was moved to tears. (I wonder if he said something similar to President K.R.Narayanan while accepting the Padma Vibhushan in 2001.) But that evening, Hrishida’s tears reminded me of Balraj Sahni in *Anuradha. * The doctor-hero, forever busy caring for patients in a ramshackle village, suddenly realizes he has been grossly neglecting his young and pretty singer-wife. The realization has a profound effect and he breaks down into uncontrollable sobs. What about Hrishida’s own wife? Mukherjee’s personal life remained a mystery even to his close associates. And given his high-priest stature in the industry, no newspaper or magazine – not even the shamelessly gossipy rags – ever dared to probe it. My senior journalist colleagues had warned me to steer clear of any discussion about his wife who, according to the grapevine, was lived alone in Calcutta for several years. When she was mentioned in passing that day, Hrishida was cryptic and deftly steered the conversation to another less controversial topic. To be sure, my curiosity about Hrishida’s personal relationships goes way beyond the realm of gossip. Surely, celebrities have the right to privacy and the dignity of being spared the media scrutiny of their private doings. But from where does a reclusive artiste, particularly one who comments on the human condition through an exploration of inter-personal relationships, tap into the subtle details that impart a throbbing credibility and a gentle humor to the intimacy shared by life-mates? Is a combination of mere imagination and second-hand sources like fictional stories good enough? At least in Hrishida’s case, we’ll probably never know. I have yet to find a more damning comment on the country’s middle-class, which is so willing to compromise its values in pursuit of material pleasures. Was Hrishida’s 1959 film crystal-gazing into an India of the 21st century?